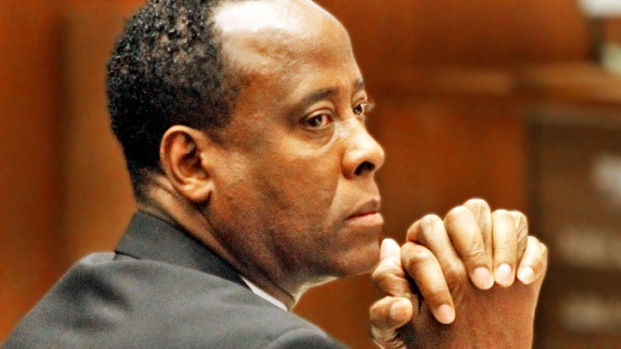 Dr. Conrad Murray's girlfriend and a woman who was on the phone with him at about the time prosecutors claim he realized that Michael Jackson had stopped breathing testified Tuesday about calls they received from Murray on the day the King of Pop died. Sade Anding, who met Murray at a Houston steakhouse, testified that she was in Houston when Murray called her on June 25, 2009, at 11:51 a.m. That's about the time that prosecutors claim Murray realized Jackson -- in a bedroom at a rented Holmby Hills mansion -- was not breathing. "He said, 'Hello it's Conrad Murray. How are you doing?,'" Anding said. "I asked how he was doing. He said, 'Well, I...' and then he just paused. That's when I said, 'Well, let me tell you about my day.'" E! Chief News Correspondent Ken Baker visits Colleen Williams on Nonstop News LA to talk about the Conrad Murray trial and the mood inside the courtroom. About five minutes later, Anding said she realized Dr. Murray was not responding to her. "I said, 'Hello, hello.' That's when I realized he was no longer on the phone," she said. "I heard mumbling and voices. It sounded like the phone was maybe in his pocket." During a brief cross-examination, Anding was asked how long she continued listening after she realized Murray was not listening. "About three to four minutes," she said. Prosecutors are attempting to prove Murray was busy balancing his personal life, medical practice and care of his superstar patient on the day his superstar patient died. During the trial's sixth day, prosecutors again used phone records to establish what they call a timeline of negligence. Murray called his girlfriend four times on the afternoon of Jackson's death, according to phone records. Nicole Alvarez testified Tuesday that one of the calls came from the ambulance that took Murray and Jackson to Ronald Reagan UCLA Medical Center from the mansion. Girlfriends of Conrad Murray, both past and present, took to the stand on Tuesday in the case against him. Jurors also heard from the pharmacist who sold the propofol to Murray. Alvarez, an actress, said Murray told her everything would be OK .
Alvarez said she met Jackson several times, including after the birth of the son she had with Murray. Murray told her that he had been treating Jackson about a year before the pop star's death, Alvarez (pictured, right) testified. She was looking forward to accompanying Murray to Jackson's series of upcoming "This Is It" concerts in London, Alvarez said. Murray had shipments of the powerful anesthetic propofol delivered to Alvarez's Santa Monica home, for which Murray paid the rent, but she said the Houston-based physician never mentioned having a medical practice in California. Later Tuesday, the pharmacist who shipped the drug to Murray took the stand before testimony ended for the day early Tuesday afternoon. Tim Lopez testified that Murray told him the anesthetic was for patients at a clinic he ran in Los Angeles. Murray did not operate a clinic in Los Angeles. Eight witnesses took the stand Monday -- the most since the trial began one week ago. The most compelling details came from Dr. Thao Nguyen, a cardiologist on duty when the pop star arrived at Ronald Reagan UCLA Medical Center. "In Dr. Murray's mind, if we called it quits at that time, it would be giving up easily,'' Nguyen said, referring to Murray's insistence that the medical team continue life-saving efforts more than an hour after Jackson arrived at the hospital. Earlier Tuesday, emergency room doctor Richelle Cooper testified that she believed -- based on radio communications with paramedics who responded to the 911 call from the rented Holmby Hills mansion -- Jackson was long dead before he arrived at the emergency room at 1:13 p.m. She advised paramedics to pronounce Jackson dead at the mansion, but Murray demanded his patient be transported to the hospital. "At the time Mr. Jackson was my patient, he had already been dead for some time,'' Cooper said, before talking about her encounter with Jackson's children at the hospital. Paramedics and the emergency room doctors all testified that Dr. Murray never told them he gave Jackson the powerful anesthetic propofol. A coroner's report shows that Jackson's death was the result of "acute propofol intoxication." Prosecutors argue that Murray administered the powerful drug, then failed to properly monitor his patient. The defense claims Jackson self-administered the fatal dose when Murray was not in the room.